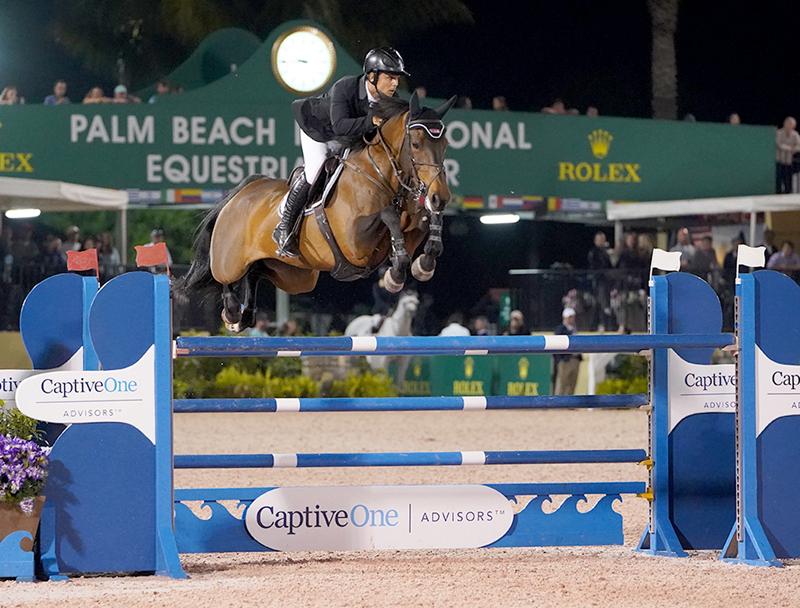 Spain’s Sergio Alvarez Moya scored a comeback victory in the $134,000 CaptiveOne Advisors 1.50m Jumper Series Final during “Saturday Night Lights,” after a six-month recovery from ACL knee surgery. Moya bested a field of 60 entries over tracks designed by Steve Stephens and Nick Granat (USA) in the International Arena at WEF by posting one of only three double-clear performances riding his own MHS Attraction. The top fifteen horse-and-rider combinations based on faults after the first round (25% of the original entries) of the CaptiveOne Advisors 1.50m Jumper Series Final advanced to a second phase to decide the ultimate winner, and faults were cumulative through the two rounds. Moya crossed the final timers in 49.59 seconds for the win over Lorenzo de Luca (ITA) aboard Soory de l’Hallali. “From the first time I rode her, I thought she was really special,” said Moya of his winning mount, a nine-year-old Irish Sport Horse mare (Numero Uno x Diamant de Semilly) that he purchased from the Bourns family in Ireland just over a year ago. “She was just in light work at home while I was out, but my people did a great job and that work paid off. De Luca and Soory de l’Hallali, owned by Stephex Stables, finished just fractions behind Moya in 50 seconds flat. Their partnership is a new one after de Luca got the ride in October and the jump-off was only the second one of their career together. The second-place finish clinched de Luca the series championship with consistent finishes throughout 11 weeks of 1.50m competition. In recognition of his series championship, de Luca was presented with a trip for six people on the CaptiveOne Advisors yacht, Reel Captivating. “I am really happy to win overall because it’s very competitive and it’s difficult to have good results here,” concluded de Luca. U.S. grand prix veteran Leslie Howard took third riding Donna Speciale, owned by Laure Sudreau, with another double-clear performance in 50.78 seconds. “We’ve had sort of a funny career with her,” said Howard. “Last year she was doing the 1.60m and getting ribbons in the World Cup. As horses happen, she got out of form, just not jumping well. Now, I feel that her scope is back. I was saying to my husband Peter that it’s the first time in a year I felt she had the scope she had a year ago. You just have to play it day by day and show them in classes they’re capable of winning, and not get caught up in the fact that just because they were jumping 1.60m six months ago, doesn’t mean they want to jump1.60m tomorrow.